He was born in Trier (Germany) in the year 340. He was elected Bishop of Milan in the year 374, being a great administrator. Ambrose is the symbol of the Church that rises after the hard years of concealment and persecution. 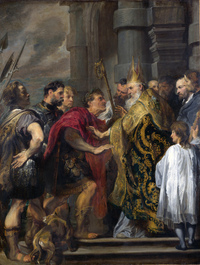 St. Augustine, who was a regular listener of the sermons of St. Ambrose, tells us in his confessions that the prestige of the eloquence of the Bishop of Milan was very large and very effective tone of this Apostle of friendship. His published books that have come down to us are quick transcripts and reuses of their speeches, little or nothing checked. As a good shepherd he liked to teach liturgical hymns his people. For that reason he composed a great number of hymns, some of them very familiar in ambrosian liturgy. He introduced in the West the alternating singing in the salms.